Four sites including; Nam Ton at Houay Kham Bridge, Ban Nalat, Ban Viengkham and Ban Koua were taken for sediment analysis. Sediment sampling was carried out in the beginning of June. Second field trip for sediment sampling was undertaken, due to the limited capacity of international lab for paraquat analysis in soil. Chemical analysis including Cu, Cd, Ni, Co, Pb, Zn, As, Hg, CN, endrin, toxaphene, chlorpyrifos, glyphosate, paraquat and Particle Size Distribution (PSD) was performed by ALS Hong Kong. The sediment sample were collected at 3 points across each section of the river, from disturbed sediment in the top 5 cm of river bed by using specifically designed sediment grab instrument. However, water level was still high in some site, thus sediment was disturbed slightly during sample collection. 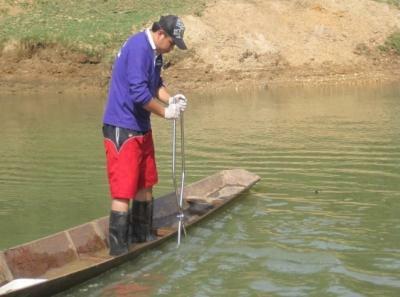 The sediment sampling at four sites showed good quality, in compliance with the Lao standard or with some exceptions all well within applicable standards where standards exist. Main sediment at Ban Nalat (SMS03) and Ban Nalat (SMS06) consists of silt, sand and clay respectively but the main sediment at Ban Viengkham (SMS11) consisted of sand, silt and clay. Gravel was not observed at those three sites. The percentage sand content ranged from 27 to 69%. Site SMS11 had the highest value (69%) while site SMS03 had the lowest value (27%). The silt content ranged from 21 to 50%. The highest silt content was recorded from site SMS03 while the lowest value (21%) was obtained in site SMS11. The clay content ranged from 10 to 23%. Clay content was highest in station SMS03 (23%), while the lowest value (10%) was obtained in site SMS11. The result of the sediment analysis showed that silt was dominant across the sites, except site SMS11 which sand was dominant. According to the lab results for metals, the values of all metals are in compliance with the existing stands, except arsenic. 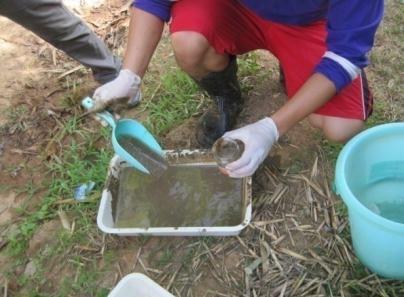 Arseniccontent were found at all monitoring sites which indicates that the source of arsenic might be the agricultural areas upstream of the project. High arsenic concentrations were even found at three monitoring sites (SMS03, SMS06 and SMS12) which were 7.0, 6.0 and 5.0 mg/L respectively.The source of arsenic can also be the mining sites nearby. Although there is no presence of arsenic contamination in the rivers from the mine operations, there can be arsenic accumulation in the river sediment due to flooding at old tailings areas or discharge. Cyanide in sediment samples were analysed to determine the influence of mining activities upstream of the monitoring sites. Results showed that the values of cyanide at four sites were all below 1 mg/kg which is in compliance with the Lao standard. There is no standard for pesticide-herbicide in sediment. All results indicate low or non-existent levels as all parameters are below the instrument detection limits. There is no Lao standard for paraquat. However, the results of paraquat at three sites were below instrument detection levels (<2.0). In general, the sediment particle size has strong correlation with heavy metal concentration, that the finer particle size will be associated with high concentration of heavy metal. Different environmental setting will also result in different degree of association for each heavy metal. For instance, diurnal variation of pH or alkalinity in combination with hydrodynamic condition on wet season when the complex mixing and river sediment re-suspension scenario are profound might result in different heavy metal concentration accumulated in river sediment. This relationship figure could be viewed clearly through long observation data sets as compared to the observed baseline information from the current sampling monitoring. 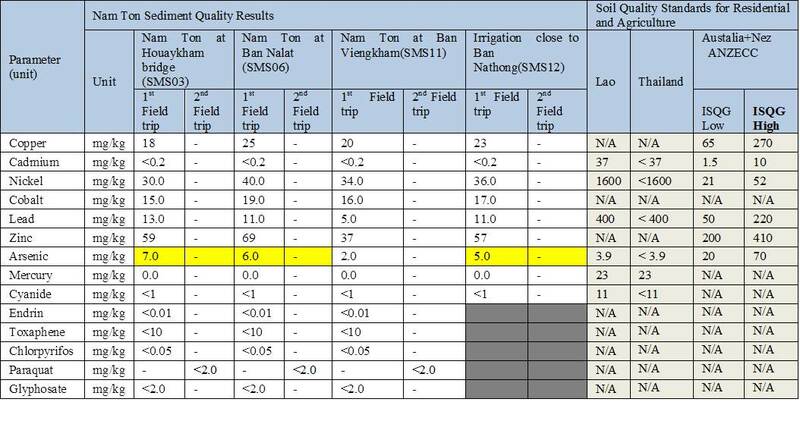 Sediment quality results.Yellow shaded values differfrom the relevant standards. Particle size result (Only 1st Field trip).